What a wonderful thought it is, that some of the best days of our lives haven't happened yet. Throughout life, one of my favorite things to do is make memories. No matter how big or small, whether good or bad, we make memories each day as we push through. I used to think the best thing about memories was making them. It was so definitely true as we were young and having crazy family times. Now, as I am more seasoned, ahem, I see the wisdom and value in those memories that were made. As we sit around and visit as a family, many memories are often brought up, “remember this or that...”, which always leads to much laughing, and more stories. It is one of our favorite things to do....relive those memories. Often, a memory rolls out of my eye and down my cheek in the form of a memory! I will forever be grateful for those memories, but also am excited about the prospect that some of the best days of our lives haven't happened yet! That means to me there are many more memories to be made. Fast forwarding my life .... 20 years from now.... what do I want those memories to be? This has made me take a hard look at life, where I am now, and not so much as where I want to be in 20 years, but what I want to have accomplished. More importantly what memories I want to have made in my own life and in the lives of my family and loved ones. What memories of me would I like to leave with each of them? If I have learned anything in life, it is that any event can easily become a treasured memory, by our attitudes and what we make of it. I have to be honest, lately I just haven't always had the best attitude about certain things, but I always try to put a smile on my face so nobody knows about it. Trust me it gets easier as you do it more often. Plus, I work in a kindergarten class room, which is packed full of memory making moments every day! I do love it! minute to see who could find the craziest thing for under $10. You didn't have to buy it, unless you wanted it, you could just take a picture on your phone! When we met for lunch a couple of hours later, we compared items. Of course there wasn't really a winner, because we each thought our own prize was the best! 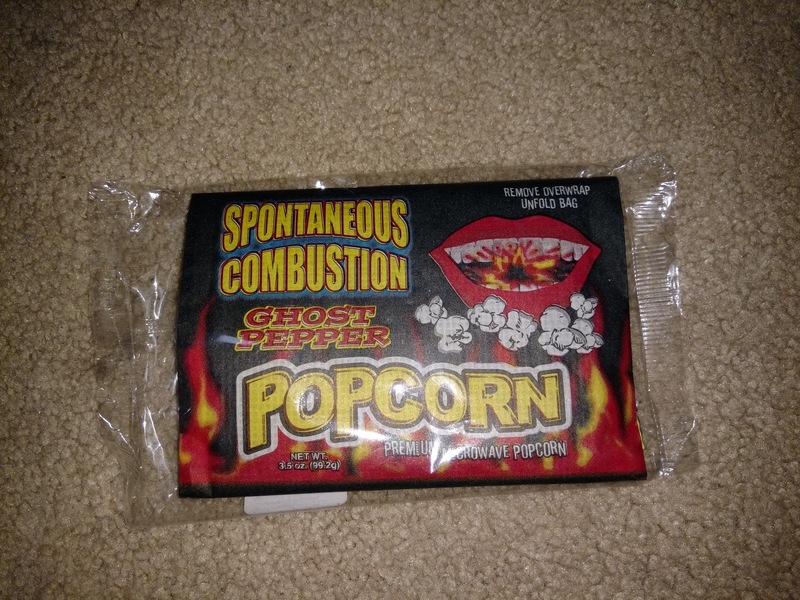 But secretly I think I won, I mean come on who doesn't think this is the craziest thing they have seen............. Spontaneous Combustion Ghost Pepper Popcorn! 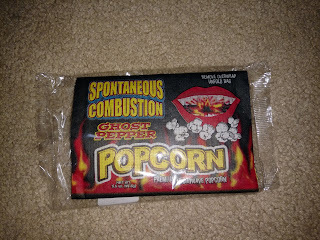 Sadly, not everyone else thought it was as great as I did. I am already thinking of how we can twist up our shopping trip for next year to make it a bit more exciting! We are making memories out of little things! Memory making moments are all around us every day. I am always looking for memory making moments, or opportunities to turn the small little things into a memory moment. Little things can make as memorable of a moment as the big things, and often more so. I don't know where the past 50+ years of my life went, because it went so incredibly fast, but I do know where I want the next ones to go, and that is in making memories, because truly in the end, all we can take with us, is what is in our brains. Yes knowledge is valuable, and I love learning things, it is an ongoing pursuit in my life, but the memories of loved ones and the things we did together..... now that is valuable! So go make some memories! I am already working on my 2017 bucket list of memories I want to make, and it has some good ones on it! Even little things like "walking up a creek for an afternoon!" Simple, but oh so memorable! The Business of Life is the acquisition of Memories. In the end that's all there is. And in the end the most important piece of advice that my past has given me, is to enjoy life while you're living it. You can never know which moments will be the ones that you'll remember and when happiness will hit you. So be open for anything at any time do not fret over the past but learn from it, and make new memories every day. For there is only one life and one chance. a.p.